– Cell structure is correlated to cellular function. How do we study cells? 1) Scanning electron microscopes focus a beam of electrons outs the surface of a specimen, providing images that look there dimensional. Focus a beam of electrons through a specimen (TEMS), there kind of electron microscope is used to study the internal structure of cells. – Ultra centrifuges fractional cells into their component parts. – Biochemistry and cytology help correlate cell function with structure. – Protests fungi, animals and plants all consist t of eukaryotic cells. In the center of nucleus there is a concentrated region called the nucleolus and this is where ribosomal RNA is made and processed it’s also the site where there’s a lot of organization of other RNA protein complexes that have to be assembled in the nucleus. And we see the endoplasm reticulum and outside of that is the Golgi and mitochondria and centrosome. Centrosome is the region where doing cell division the chromosomal DNA comes together and we have also lysosomes, peroxisomes and in the outside of the cell we see microvilli protruding from the cell. – The nucleus contains most of the cell’s genes and is usually the most consequence…. organelle. – The nuclear membrane is a double membrane each membrane consists of a lipid bilayer. – Pores regulate the entry and exit of molecules from the nucleus. – The shape of the nucleus is maintained by the nuclear lamina which is composed of protein. – Ribosome are particles made of ribosomal RNA and proteins. The endomembrane system regulates protein traffic and performs metabolic functions in the cell. The endomembrane system regulates protein traffic and performs metabolic function in the cell. These components are either continuous or connected via transfer by vesicles. – The endoplasmic reticulum (ER) accounts for more than half of the total membrane in many eukaryotic cells. – The ER membrane is continuous with the nuclear envelope. – There are two destinct regions of ER.
.) Rough ER with ribosomes studding its surface. – A lysosome fuses with the food vacuole and digests the molecules. – Lysosomes also use enzymes to recycle the cell’ s over organelles and macromolecules a process called autophagy. Mitochondria and chloroplasts change energy from one form to another. – Mitochondria are the sites of cellular respiration a metabolic process that generates ATP. – Chloroplasts, found in plants and algae are the sites of photosynthesis. – Peroxisomes are oxidative organelles.
.) have proteins made by free ribosomes. – They have a smooth outer membrane and an inner membrane folded into cristae. – The inner membrane creates two compartments: inter membrane space and mitochondrial matrix. – Chloroplasts are found in leaves and there green organs of plants and in algae. – Peroxisomes produce hydrogen peroxide and convert it to water. The plasma membrane:Is the boundary that separates, the living cell, from its surrounding and exhibits selective permeability, allowing some substances to cross it more easily than others. -Phospholipids are amphipathic molecules, containing hydrophobic and hydrophilic regions. -The fluid mosaic model states that a membrane is a fluid structure whith a “mosaic” of various proteins embedded in it. – Freeze fracture studies of the plasma membrane supported the fluid mosaic model. – Freeze fracture is a specialized preparation technique that splits a membrane along the middle of the phosphatide bilayer. – Most of the lipids and some proteins drift laterally. -Integral proteins that span the membrane are called transmembrane proteins. -The hydrophobic regions of an integral proteins consist of one or more stretches of nonpolar amino acids. -The asymmetrical distribution of proteins, lipids and associated carbohydrates in the plasma membrane is determined when the membrane is built by the ER and Golgi apparatus. 1)Diffusion is the tendency for molecules to speed out evenly into the available space. 3) At dynamic equilibrium, as many molecules cross one way as cross in the other direction. 1) Osmosis is the diffusions of water across a selectively permeable membrane. 2)Water diffuses across a membrane from the region of lower solute concentration to the region of higher solute concentration. Water balance of cells without walls. Tonicity is the ability of a solution to cause a cell to gain or lose water. Hypotonic solution: solute concentration is less than that inside the cell; cell gains water. Transport proteins: Transport proteins allow passage of hydrophilic substances across the membrane. Some transport proteins, called channel proteins have a hydrophilic channel that certain molecules or ions can use as a tunnel. 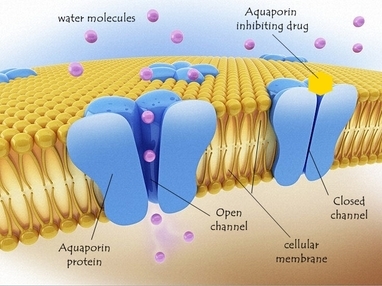 Channel proteins called Aquaporin facilitate the passage of water. Facilitated diffusion, passive transport aided by proteins, facilitated diffusion : transport proteins speed the passive movement of molecules across the plasma membrane. Active transport uses energy to move solutes against their gradients:Facilitate diffusion is still passive because the solute moves down its concentration gradient.Some transport proteins however can move solutes against their concentration gradient.Active transport moves substances against their concentration gradient.Active transport requires energy usually in the form of ATP.Active transport is performed by specific proteins embedded in the membranes. Ion pumps maintain membrane potential:Membrane potential is the voltage difference across a membrane. Voltage is created by differences in the distributions of positive and negative ions. Large molecules, such as polysaccharides and proteins, cross the membrane in bulk via vesicles. 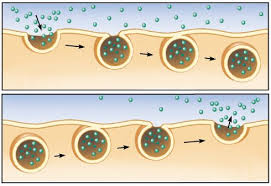 In exocytosis transport vesicles migrate to the membrane, fuse with it and release their contents. In endocytosis the cell takes in macromolecules by forming vesicles from the plasma membrane. Cell division is incredibly tightly regulated (cancer is described as an unregulated cell growth).In respect tothe cell division,there is a machinery that is a transitory state and this machinery is renewed every cell cycle. 1) Spindle: is made of microtubules or cytoskeleton, centrioles, kinetochores and contractile ring. 2) And this machinery is controlled by a control system which integrates signals from growth and division. 1/year, and the cells of gut are dividing 1/day . of division .So chloroplast and mitochondria split during cell division . D) Centrosome = centriole is the poorly understood in eukaryotes cells. role in mitotic spindle apparatus and centrioles are structures, that DNA contemplate his replication. G1 and G0: G1 is the phase in which the cell ask herself “am I big enough to divide” are there enough food? to divide the cell goes back to G0 phase where there is no division. S phase : the phase in which nuclear DNA replication and mitochondrial DNA replication occurs . G2: another decision making phase is G2: cell verify if every single genome has been replicated or not. If it has not, there is a mechanism that ask the cell to halt in G2 until the last nucleotide could be replicated. G2 will be prolonged until the cell has all needed to go to M.Another control point is to see if each kinetochore archived bipolar spindle attachment. Chromosomes consist of one DNA molecule and the proteins associated with that and we must not underestimate the importance of the proteins and the mass of proteins associated with the DNA (their mass exceeds the mass of DNA). There are critical landmarks on the chromosomes and the most important is the centromere. The centromere is the point at which the chromosome attaches to the spindle apparatus to allow chromosome segregation that is it’s only function; but at this point there is a very complete protein structure (fifty different proteins called connect cord. So, the connect cord is the structure that assembles at this point to archive protein segregation). We know that there are the origin of replication on DNA, result in eukaryote cells there are multiple origins of replication. At the very end of chromosomes, there are specialized structures called telomerase. Telomerase the enzyme which intervene in the replication of telomere. Chromosomes have lots of genes collectively our chromosomes. The letter N is used to refer to number of chromosome haploid cell. N is a discontinuous functions but the C value is the continuous function. But in G2 the number of chromosomes dose not change. How do we measure DNA content?